As I sat watching ‘Larkrise’, with a blanket that was crocheted for Munchkin when he was born, wrapped around my shoulders, I noticed Minnie’s shawl, wrapped around her shoulders, and was struck with inspiration! 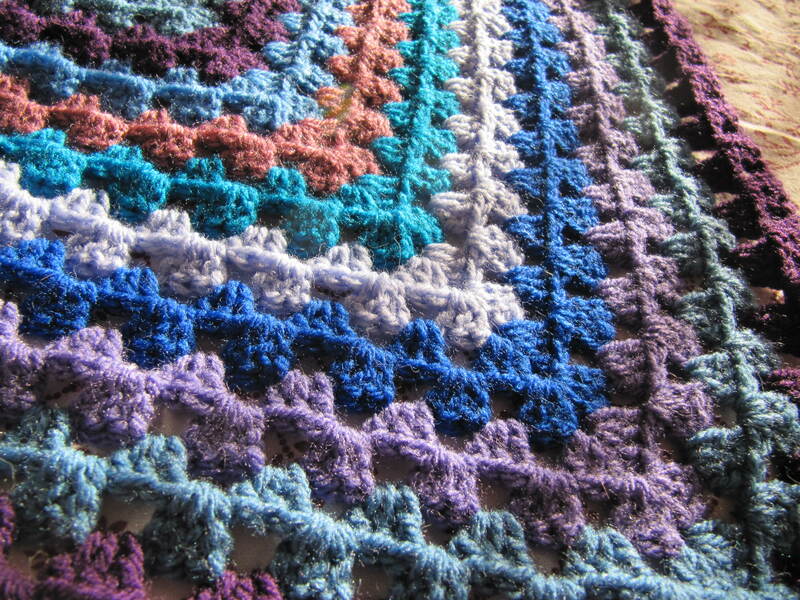 So now I have THREE crochet projects currently on hook! I am a great starter of projects!, can you tell?! But I need to start finishing them so that is one of my resolutions for 2011. There are 8 different colours, 4 blues and 4 purples. All acrylic this time! The sun shines through my bedroom window, making a bright room for photo taking! Another gorgeous day but absolutely freezing! We’ve already taken Munchkin’s cousin to school, walked Sky and I have experienced the ice and frost first hand… and bottom… and back… and head. Yep, I slipped and landed flat on my back! Yep, I did hit my head on something hard but I wasn’t knocked out nor concussed thankfully! And I thought DM’s were perfect footwear for all weather!! 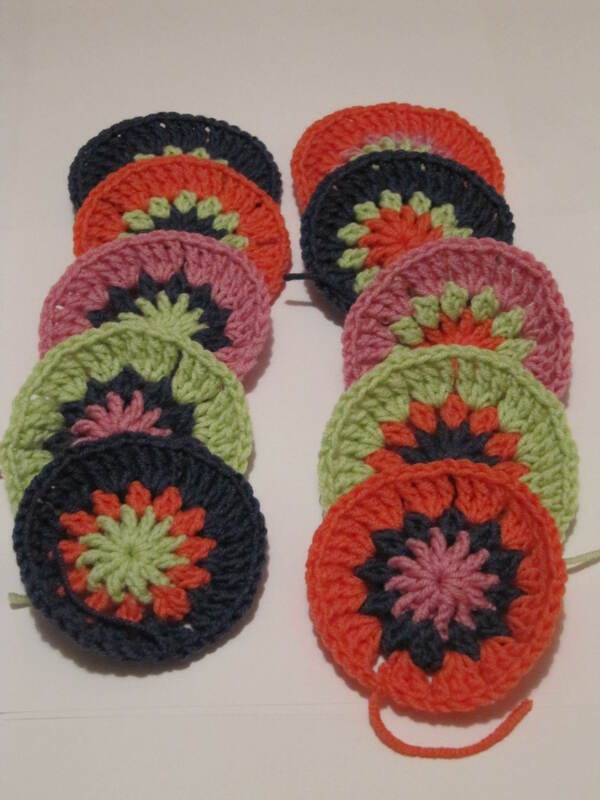 Well, I’m off to do housework-y stuff, entertain Munchkin and maybe fit some crochet in if I can… Bye for now! These two projects are only being worked on when Munchkin is lying fast asleep beside me in bed so progress is slow but steady! Spare time over the next couple of days is all for my car seat cover – I have high hopes about this, really hope it actually fits! My sister gave me the yarn for xmas. Isn’t it gorgeous?! See how the colours are almost in ‘blocks’? Mmm, it’s so soft too. See the silvery blue? Oh I cannot wait to see how it will work up! Next we have the circles. 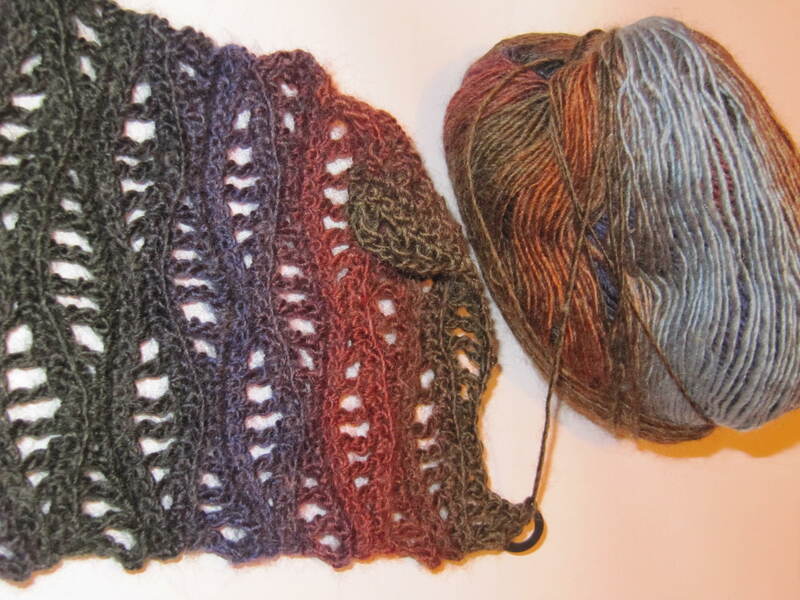 Now these are made from Sublime Yarns Baby Cashmere Merino Silk DK (mouthful!) My dad gave me four balls of this yarn for xmas and I’ve decided to make a circles blanket with them. I have got a very, very long way to go! Please excuse the darkness in the photos – the skies are as grey as grey can be! I hope your big day went well, ours was lovely and Munchkin had the most wonderful time seeing family, munching on junk food and of course – pressies. So it’s back to normal now, at least until New Years Eve. The snow, which had either turned grey or to ice has now been rained on and my little car is back on the road (well, he’s drivable!) so we had a quick jolly out this afternoon on a much needed food shopping trip. Later in the week we’ll go for a proper drive out to clear the snow-covered cobwebs. Two of my presents this year included Sublime yarn from my Dad and a varigated wool mix by King Yarns from my sister. 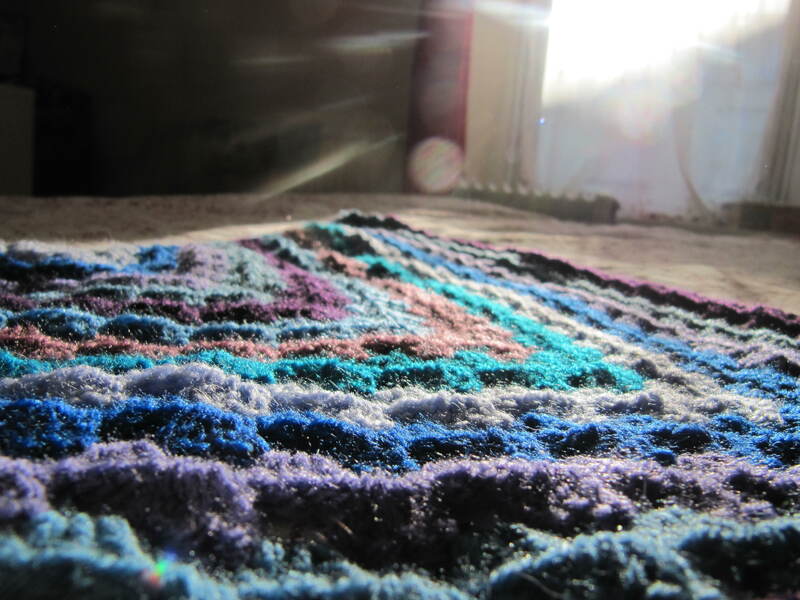 The sublime is being crocheted into a blanket and the varigated into a scarf, I’ll post up a couple of peeks soon – the light here is absolutely awful right now what with the ‘Big Thaw’ and fog we’re having! Another of my gifts, this time from my little brother, was The Selfsufficientish Bible by Andy & Dave Hamilton – founders of this site and forum . It’s a great book, I haven’t had enough time to really have a good read of it yet but I’m liking what I’m seeing. I’ve been a member of the forum on and off for over two years. They’re a really great bunch of people on there, you couldn’t find a friendlier forum! Oh! Have you tried Vegetarian Haggis by Halls?! Oh! My sister is living in Ullapool for a while and brought some down for us. How delicious! I was dubious at first but now I want to try more… or even better figure out the recipe! It’s a blend of veggies, lentils, beans and oatmeal, it’s very peppery and full of flavour. If you can get your hands on some I strongly urge you to give it a go! Well, I need to go and sort a little Munchkin out. He hasn’t had a nap today and is getting a wee bit sleepy!